Personally, I’m putting this out there because I feel that it’s important that people know about it and that there be a public record of it. Because of my injuries, which included a broken back, and the medication that I was taking for those injuries, it did take me a while to get this written, but once again, I think it is important to get this on the record. Not unlike other issues involving Cop Block related activities, when those activities make you a target, visibility and transparency are important not just to ensure accountability but to provide protection for those involved. I really don’t want to see any other “coincidences” happen to any of my friends or other activists within the Las Vegas area and making it public makes it difficult for it to happen again without people connecting the dots. This account is rather long, but I don’t think I could have condensed it much more and still shown all the various connections and commonalities between the incidents of the week in question and the past two years that establish the possible motives and “likely suspects.” To make things a a little easier to follow, I did create a timeline that lays out most of those connections in a visual manner, which you can find a thumbnail to below. That week actually consisted of four separate incidents involving members or associates of Nevada Cop Block and the Sunset Activist Collective (a local activist group that several members of NV Cop Block also belong to). All four of those involved members with ties to anti-police brutality activism, in general, and protests using chalk, in particular. That detail is fairly significant because last August the LVMPD dedicated an entire task force and two months of their time to investigate, charge, and arrest four people (the “Sunset 4“), including myself, for conducting chalk protests relating to police killings in the Las Vegas area and the lack of accountability for questionable shootings or even several that amount to outright murder. When the cops in Las Vegas kill people their ONLY “punishment” is paid leave. The first of these incidents, on March 4th, 2014, was when one of the “Sunset 4” arrestees was stopped by Metro police for the rather arbitrary reasoning of supposedly following the car in front of her too closely. To further complicate this incident, just prior to the stop, she had dropped off Ballentine, who had also been among those of us arrested in August of 2013, prior to being stopped. During the stop, the cops brought up the fact that she had been arrested for chalking and questioned her about her involvement in protesting. At the time, it was considered harassing, but because it was the first incident, it was assumed that they had just noticed the arrest on her record and wasn’t widely believed to be a targeted act. Later that same evening, the second incident took place, this time involving local activist Jen Harney, who had organized a widely publicized protest shortly after the chalking arrests. Similar to my own incident, while crossing the street downtown she was hit by a car. Later, it was determined that the person driving the car she was hit by was not only an ex-cop, but that he currently works for a company that sells weapons and equipment to police departments. The very next night, on March 5th, I was walking to the bank down Charleston near Las Vegas Blvd. As I (legally) crossed 8th street, a car made a right turn off of Charleston, ran into me, and kept going. During the collision, I suffered a concussion, and as is often the case in accidents, I don’t remember much beyond the initial point where I saw the car was going to hit me. However, I do have some hazy memories of afterwards and I’m pretty certain that the car didn’t make any effort to stop at all. Finally, the last incident happened two days later on March 7th, 2014, during a “First Friday” art festival, which is held every month in downtown Las Vegas. Once again, this involved Jen, who was holding the official grand opening for a gallery and art supply store she owns. Late in the evening, a group of uniformed LVMPD officers came to the store. While there, they displayed no actual interest in shopping, but instead stood together outside looking through the window. Soon after, they approached the doorway and again just stood watching as Jen’s partner, who is not particularly involved in activism, spoke to some customers. She asked them if there was anything she could help them with and subsequently asked them if they would like her to give them a tour of the gallery. They refused both those requests and continued for some time behaving in a way that made her feel very “freaked out” and intimidated, in general. First of all, as has already been pointed out, all four of the incidents involved someone with both a connection to anti-police brutality protests and the previous chalking arrests. Secondly, three of those four incidents involved obvious, direct, and provable connections to the police and even to the LVMPD. The lone exception to that is the hit and run against me, in which the driver has not been identified. Thirdly, the limited time frame itself casts suspicion on the randomness of these events. All four of these incidents happened within a 96 hour period and three of the four took place within 24 hours of each other. Expanding beyond that, there are even more common connections than those simple, obvious ones. On February 14th, 2014 officers from the Bureau of Land Management (BLM) abused and subsequently murdered a man after cyclists called 911 to report that he was attempting to flag people down and appeared to be in need of assistance by Red Rock Canyon, just north of Las Vegas, and instead of offering that assistance they sent police to arrest him. In response, members of Nevada Cop Block conducted a protest involving chalking at the headquarters of the Nevada Highway Patrol, which had also had an employee present at the shooting, a few days later. This particular protest took place roughly two weeks prior to the beginning of the four incidents. In addition, an undercover police officer in an unmarked vehicle was parked across from the NHP headquarters when those taking apart arrived, even though it hadn’t been announced publicly until about thirty minutes before it was scheduled to take place. This clearly shows that the police are still closely monitoring (the justification for those earlier illegal arrests involved surveillance by the LVMPD, both online and in person, which was detailed in the arrest reports) the activities of NVCB and the Sunset Activist Collective. Yet another “coincidence” is that these incidents all took place during the week prior to the second Saturday of the month. This is significant because “Second Saturdays” are the days on which the regular monthly anti-police brutality protests that lead to the arrests for writing things the cops didn’t like with chalk are typically held. And a protest at the headquarters of the BLM was in fact scheduled for that day, although it was postponed by one day (see below) due to the four incidents that week. There are no shortage of clear motives for Las Vegas police to go after members of Nevada Cop Block and the Sunset Activist Collective. Members, both individually and as a group, have a long history of being very active within local grassroots organizations. This has often involved acts of civil disobedience and many times has involved direct criticism of the police and their historical lack of accountability. After the murder of Stanley Gibson in December of 2011, a regular, sustained pattern of such protests began. Metro showed their willingness to engage in retaliation and intimidation against those who would dare to criticize them and their policies by engaging in a targeted and concerted effort to justify arresting us on trumped up charges. Not only did they attempt to characterize drawing with chalk as a graffiti crime, but they also threw in the old standby for “stacking” charges of conspiring to commit the non-crime. In order to do so, they created an actual task force dedicated to investigating, charging, and arresting some people writing stuff with chalk. Also, as detailed in the police arrest reports, they engaged in surveillance of those they wished to arrest. This included monitoring of online and social networks (Facebook, Twitter, Youtube, etc), as well as actual, physical surveillance. Additionally, even the bogus graffiti charges only allowed for a citation to be issued, which the city had already refused to prosecute, unless the “damage” caused amounted to more than $250. So, in order to arrest the “Sunset 4” they had to convince the county District Attorney to actually prosecute it and they had to inflate the clean-up costs for something that throwing a little water on would remove. All of that (once again) was for some people writing stuff with chalk on sidewalks. Not surprisingly, there was a rather large uproar within the community once the ridiculousness of the charges and the outrageous $1550 clean up bill was made public. This led to the charges being dropped shortly after and was yet another in a long string of embarrassing incidents that would eventually lead to Clark County Sheriff Gillespie announcing that he would not be running for office again in the upcoming election. The story also got picked up by the AP and received national press coverage, which had the inverse effect of shining a bright light on all the questionable killings and complete lack of accountability toward them that we had been protesting in the first place and which they were trying to intimidate us into not bringing attention to. Those arrests were, of course, not the first time Metro has abused their authority or retaliated against someone. In a pretty well publicized incident, they came to the house of the widow of a man they murdered and held her brother hostage until she agreed to allow them to search that house in an (unsuccessful) attempt to find a weapon or some other incriminating evidence to justify their killing of him. Another well known case involves a woman who was arrested while appearing in Family Court after she reported having been sexually assaulted by one of the marshals working at the court. Similarly, a Las Vegas Constable was recently placed under investigation for stalking and sexually harassing a woman and then shooting her dog when she refused his advances. In yet another case, the lawyer for a group of bikers involved in a harassment lawsuit against Metro was himself arrested. The LVMPD doesn’t limit themselves to retaliating against and harassing everyday citizens, either. It was recently reported by a former Metro captain that the top brass within the LVMPD held an internal meeting to coordinate an effort to dig up dirt on Clark County Commission Chairman Steve Sisolak. The reason that they wanted to do so was in order to discredit him after he opposed a proposal to raise Las Vegas area sales taxes to finance the hiring of additional cops (more on that later). Why Would They Come After Me Specifically? This is something that people not familiar with local police issues and the people involved in those issues might ask. One of the more obvious reasons why I would be chosen is a simple matter of convenience. I’m pretty well known around town for being an avid bike rider and prior to being injured I rode on the average about three hundred miles a week between commuting and recreational group rides. So, if you were going to pick someone to target with a car “accident,” picking the guy who’s on a bike in traffic at least two or three hours every day is a pretty easy choice to make. However, anyone familiar with Nevada Cop Block‘s and my own actions over the past two years probably already has a pretty good idea of the deeper reasons. I founded NVCopBlock.org shortly after Officer Jesus Arevalo, who was at that time an employee of the Las Vegas Metropolitan Police department, murdered (on video) a friend of mine from high school, named Stanley Gibson, on December 12, 2011. While I had been involved for quite a while in activism and anti-governmental abuse issues locally and informally with Cop Block on a national level, this unnecessary, and in my opinion intentional, killing of an innocent, unarmed person that I actually knew made things personal for me. At the same time, the LVMPD and their lobbyists within the Clark County government were busy undoing reforms that had been created to address the glaring lack of accountability that the much criticized Coroner’s Inquest process allowed. They were, in fact, working to replace those reforms with a new system for reviewing police fatalities that was even worse and less transparent than the original Coroner’s Inquests that had failed to hold even one single cop accountable for shooting someone, even when that person was unarmed and/or completely innocent in the entire history of the Las Vegas Metropolitan Police Department. Knowing that they intended to ensure Stanley Gibson would join Erik Scott, Trevon Cole, Orlando Barlow, and Henry Rowe on the long list of people blatantly murdered by local police for which no accountability would be afforded or even pursued. I and others involved with Nevada Cop Block and the Sunset Activist Collective began staging demonstrations against the circumvention of the inquest reforms and police brutality, in general. This soon evolved into regularly scheduled protests held every “Second Saturday” of the month and came to include writing with chalk as a regular method of exposing police abuses and paying tribute to their victims. This continued for about nine months before police first tried to intimidate us by issuing us citations for writing on sidewalks with chalk that is specifically sold for the purpose of writing on sidewalks. While those bogus tickets were never even filed, they set into motion the chain of events that led to the even more bogus arrests about two months later. That in turn led to even more embarrassment for Metro after public outrage at the ridiculousness of the charges and inflated clean up costs required to justify them led to those charges being quickly dropped. Shortly after that, Sheriff Gillespie announced amidst an almost constant barrage of scandals involving the LVMPD that he would no longer be seeking reelection for the next term, but that he would instead be putting his full efforts into passing the “More Cops” tax, which would increase the county sales taxes in order to fund the hiring of additional cops, and that getting it passed would be considered his legacy as sheriff. I don’t normally get very involved in the formal political process because it usually amounts to nothing more than a waste of time and resources that could be better spent elsewhere. However, partly because of my desire to connect with and support some very cool people and groups that had supported me while I was in jail and partly because it presented me with an opportunity to bring even more public attention to Metro’s abuses and personally confront those enabling and even encouraging it, such as Sheriff Gillespie and Las Vegas Police Union spokesman Chris Collins, I did become very involved in the fight against the More Cops tax. Although they kept trying to bring it back hoping to outlast the opposition, ultimately Sheriff Gillespie’s “signature proposal” was defeated and in the process those that spoke out against it were able to bring a lot of attention to the waste and abuses within the LVMPD. Our “graffiti” arrests and the inflated clean up costs used to justify them, were often cited as examples of both those things. During the first time I spoke against the tax, a picture of me pointing at Sheriff Gillespie and calling his decision to refuse a recommendation to fire a cop that had shot an unarmed man because he thought his hat was a gun disgraceful was posted in the local paper as part of the coverage of the Commission’s vote against it. Also by chance, during the public comments for the final vote a few months later, when the tax was ultimately defeated (until the next sheriff gets into office and brings it back), I actually ended up at the podium at the same time Chris Collins, head of the Las Vegas Police Protective Association – the police union – and was able to reference a previous comment he had made that all the money being wasted and all the people being wrongfully killed “had nothing to do” with the More Cops tax. Those two instances of public defiance of the two biggest mob bosses in the Las Vegas Metropolitan Police Department, along with the ongoing protests and the public embarrassment caused by their previous attempts to bully us into stopping with citations and arrests, would by themselves be enough motive for someone to want to send a message to members of Nevada Cop Block and the Sunset Activist Collective and to want to personally retaliate and try to intimidate me. As was shown by their plan to discredit Clark County Commission Chairman Sisolak, the defeat of the tax increase that was so coveted was enough to make them want to strike back at those involved in opposing it. Furthermore, their attempts to have us arrested and jailed for four years (contrary to the single year that was widely reported, we actually potentially faced one year for each of the four charges against us) for drawing on a side walk with something that would take a couple minutes to clean up with some water and a broom (and in fact didn’t need to be cleaned up unless someone didn’t want people reading the things written about them), shows their vindictiveness toward us. Even with all of those reasons to potentially want to go after NVCopBlock in general and myself in particular, it might still seem a bit farfetched that they would actually try to assassinate me with a car. In fact, I hadn’t been on the look for that sort of tactic and wasn’t entirely convinced it was the case until after the “First Friday” incident, simply because it’s so incredibly easy for Las Vegas area police to get away with murder that I always figured if they wanted to come after us they would just shoot at us. However, within the past few days a story surfaced in which a Muslim that the FBI was trying to pressure into becoming an informant actually recorded a federal agent warning him that he “might get hit by a car.” So it’s not exactly a foriegn concept to them. For decades, law enforcement agencies have employed “COINTELPRO” type programs to intimidate, falsely imprison, disrupt, and even kill activists and members of activist groups. On a federal level, the FBI used such tactics against MLK, Malcolm X, Jerry Rubin, Fred Hampton (who was drugged by a police informant and then murdered by Chicago police in his sleep), and even Albert Einstein, based primarily on their political activities and perceived threat to the power that those in authority at the time held. On a side note, while I don’t actually suspect that the Feds were involved in our incidents, someone self-identifying as a member of military intelligence did show up to our chalking actions at the Regional Injustice Center, one of the actions for which we were later arrested. The “Aftermath” – AKA: Did It Work? If that question is taken literally, then it did almost work. 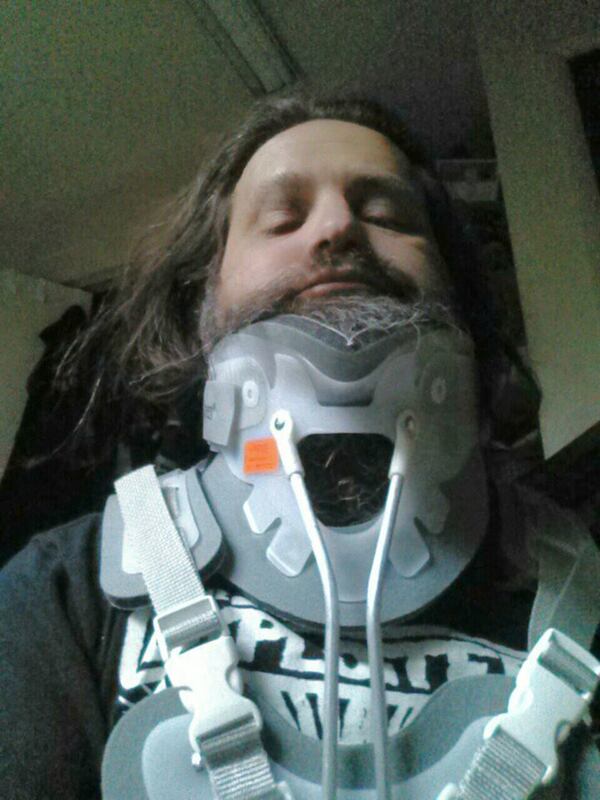 As a result of the hit and run, I suffered a pretty severe concussion, a very badly bruised shoulder, and worst of all a compression fracture to my spine (which necessitated the ridiculously uncomfortable brace in the picture at the top of this article that I had to wear nonstop, including while sleeping, for an entire week). While I’m much better and at this point it’s just a matter of some residual pain, I am still recovering from that broken back two months later. I’m also quite certain that had I been hit even a fraction of a second earlier and been more to the center of the car, rather than toward the right corner, I probably would have been killed rather than injured. However, since I wasn’t killed, the answer is an unequivocal no. If anything it makes me more determined to expose them for the criminals they truly are. Not only did they not intimidate me into stopping, the “Second Saturday” protest that we had scheduled to bring attention to D’Andre Berghardt Jr., the person the BLM murdered out by Red Rock Canyon in February, 2014, went on as planned with just a one day postponement to Sunday. Personally, I think that the fact they felt they needed to take me out just shows that what we’ve been doing is working and getting to them. Plus, I think we owe it to the people that have been murdered in the past without any justice or accountability to keep at it. Although, both the arrests and the recent incidents have actually caused some of the people who originally came to our demonstrations to back off, the LVMPD and other Las Vegas area police departments can count on the fact that I won’t be going away anytime soon and nothing they do will ever be enough to intimidate or scare me away from demanding true accountability from them. In somewhat unrelated news, Nevada Cop Block recently had personalized Cop Block t-shirts created bearing the fancy new NVCopBlock logo, which is awesome (and I’m not just saying that because I’m the one that designed it). And of course, as always you can still order the Official Cop Block Press Passes via the Nevada Cop Block Site shop. Additionally, the entire shop has been updated to accommodate the T-shirts and other new items that will be added soon. One of the new features is the ability to use Bitcoin and other “crypto” currencies within the shopping cart, if you’re into alternate currencies. (You can still donate directly to our Bitcoin wallet, also: 1JaQEAyPS71GW2JPPCMqMN53mTGMjVqctT). Another really cool new feature with the new shop is that it has the option to sign up as an affiliate. What that means is that you can obtain a personalized referral link to share on your own website, Facebook, Twitter, or pretty much anywhere else you can post links. Whenever someone using that link purchases something on NVCopBlock.org, the person assigned to that link will receive 10% of any amount spent. So you can actually make a little money yourself by referring people.